When two talented artists come together to produce a track, the results are typically extraordinary. They say two is better than one, and internationally renowned producers Alok and Felix Jaehn have demonstrated just that with their fresh track “All The Lies” with The Vamps. Out now on Spinnin’ Records, “All The Lies” showcases a synchronized blend of Alok’s typical Brazilian-inspired deep house sounds amidst Felix Jaehn’s soothing yet uplifting tropical house notes. Accompanied by its heartfelt lyrics, there’s no surprise as to why this melodic track has reached over eleven million plays on Spotify since it’s official release earlier last month. The track brings about somewhat of a nostalgic feeling. It’s as if we were brought back to a time we’ve left behind in the past but somehow also feels good to look back on. A track filled with a rhythm to effortlessly vibe to, it couldn’t have been released at the most perfect time of the year. While Alok and Felix Jaehn are beating to the rhythm of their own drums when apart , together they’ve proven to be the perfect musical pair. 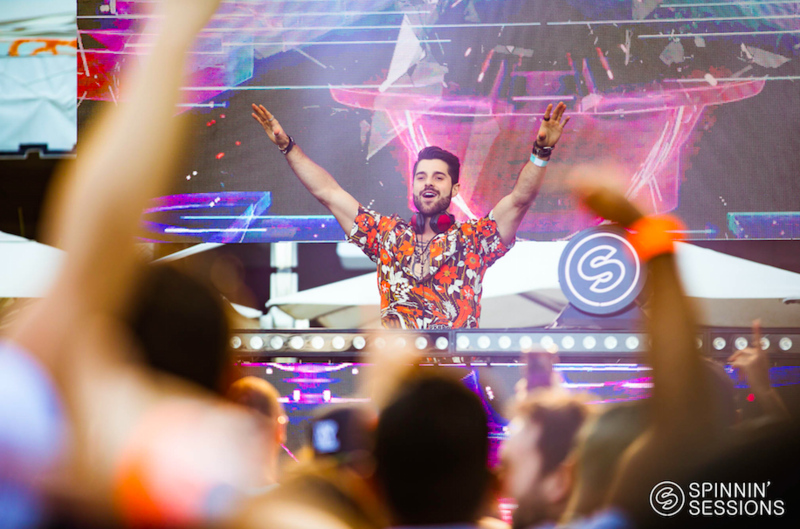 With both artists having a dominant role in the Spinnin’ Records roster, it’s no mystery why “All The Lies” has become such a worldwide hit as quickly as it has. On top of creating consistently remarkable music, both Alok and Felix Jaehn have been touring the globe performing at some pretty grand events and music festivals. Their individual development as artists in the electronic dance music world has escalated tremendously since both of their upbringings, and we’re certain it’ll only spark up even more from here. The Nocturnal Times: We’re so excited to have you both here. How does it feel to be back in Miami during the thrill of it all this time around? Alok & Felix Jaehn: It feels good to be back for sure! Hot weather, incredible people, and amazing vibes, what more can you ask for? It’s definitely been a crazy week but worth every second. A good mix of work and play is always a good time. The Nocturnal Times: Although you won’t be playing Ultra this year, are there any upcoming show or festival appearances either of you are looking forward to? Alok: Yes, unfortunately I am going back to Brazil tomorrow morning and won’t make it to Ultra this year but it’ll be nice to be back home and play Villa Mix Festival in my country. Nothing like playing for your home and for your people. Felix Jaehn: I honestly can’t wait to play Ultra Miami again but it feels nice to just be here throughout the week that leads up to it. I’m heading back home to Germany also after my time here in Miami, so I’m excited to play all the different shows I have planned over there. Parookaville later this summer will be fun too! The Nocturnal Times: Now that Ultra Music Festival has expanded tremendously globally, what other UMF exclusive locations that you’ve performed at besides Miami have been your favorites? Felix Jaehn: The last time I played Ultra here in Miami was unreal. It will always hold a special place in my heart. I would say Ultra in Cape Town, South Africa was absolutely incredible. The atmosphere, the weather, the people. It was all so amazing. The Nocturnal Times: Both of you have a significant presence in the electronic dance music world. Has your outlook on grand events such as these that go on during MMW and WMC changed after being exposed to so many as your career has progressed? Alok: I think that as you progress as an artist, you begin to have more and more responsibilities of course. But it is reassuring in some way to know that you have such a strong presence at these type of events, it reminds me that all my hard work has paid off. So every event is special to me, even as the time has gone by. We’re always growing. The Nocturnal Times: How does it feel to perform at events hosted by the record labels you are a part of in comparison to those hosted by other major event production companies? Alok & Felix Jaehn: I think we can both say it’s more welcoming because you’re surrounded by those you work closely with and by people who make you feel at home. It’s fun to meet new people in the industry at other events, but there’s something special about attending an event for a label you’re actually a part of. The Nocturnal Times: Alok, you come from a family with a strong electronic music background. Did you grow up constantly listening to all these intricate sounds because of them? Alok: Yes, of course. Both of my parents have been producing electronic music for years. This music has always been a huge part of my life. Not everyone has parents who are DJ’s, and now that I am one too it’s brought us even closer together. The Nocturnal Times: Would you say that they influenced you to pursue a career in the music industry? Do you also create music similar to theirs aside from your typical sound? Alok: Growing up constantly surrounded by their music definitely made me wonder what it would be like to create sounds for myself. They have always inspired me, and I’m glad I chose the path that I did. My parents focus on more underground and psytrance sounds, so mine is a little different than theirs. But, I do experiment with different styles. My latest song with Armin and Vini Vici shows that side of me that has always loved psytrance just as much as my parents. The Nocturnal Times: Felix, what inspired you to pursue a career in music? Were you always fond of the electronic genre? Felix Jaehn: I’ve been into music since I was a little boy, and once I reached my teenager years I started listening to electronic music since it was so popular in Germany. I realized it was a genre I wanted to be a part of since I loved it so much, so I began to mix and produce on my own ever since. The Nocturnal Times: Did you think you would be where you are today from the moment you decided to chase this dream of yours? Felix Jaehn: I always believed in myself, I just didn’t think all of this would happen so fast. I’m truly thankful and blessed for working hard and making it as far as I have. The Nocturnal Times: Tell us more about your latest track together, “All The Lies” which is out now on Spinnin’ Records. What led you guys to decide to collaborate on this big project in the first place? Alok & Felix Jaehn: This is our biggest project so far this year and we couldn’t be more excited! The Nocturnal Times: Is there a particular story line behind the track’s music and lyrics? Is it meant to spark listeners in any particular way? Alok & Felix Jaehn: We wanted to create a track together that could make people dance but also touch their hearts. The lyrics are pretty emotional if you really listen to them, but that was the point. I think most listeners can relate to the track, and those are the type of songs that usually stick with people for years and years even after they are released. The Nocturnal Times: You’re set to perform at this Spinnin’ Sessions pool party later on today. Will we be hearing “All The Lies” live in action throughout your upcoming set? Alok: It was meant to be a surprise but Felix will actually be joining me to play our new track during this Spinnin’ Records party. We’re both really excited and I hope the crowd loves it as much as we loved creating it!